So, Blades is one of my favourite Protectobots. Part of it is, of course, due to the long-running depiction of the Protectobots as actual fleshed-out characters in this site�s old RPG, courtesy of Zigzagger� but even before I discovered the RPG I always found Blades a hilarious anomaly. All the other four Protectobots talk about how must they love peace, how much they want to protect the innocent and rescue the wounded� except for Blades. He just wants to beat people up, man. Such a strange career choice that Blades had, to join the Protectobots. It does easily make him one of the most interesting characters released in the 1985/6 period, though. Well, Blades has gotten a lot of representation over the years despite being a relatively minor character, never really getting much screentime both in the cartoon or in the comics. You�ll probably get one off-handed line about how he wants to shoot or beat people up, but that�s about it. Hasbro likes to repaint their helicopter moulds after Blades, though, with him getting at least three random repaints in the Universe 2.0/Generations line, a couple of repaints based on his deco in Revenge of the Fallen, and one of the characters from the Rescue Bots toyline. Of course, none of them combined, not until now, anyway. With the Combiner Wars toyline, Hasbro took pains to replicate the original lineups and gimmicks of the original Scramble City style combiners. It�s a very ambitious undertaking, and some slight sacrifices needed to be made, one of which is folding the Combaticon Vortex and the Protectobot Blades into the same mould. 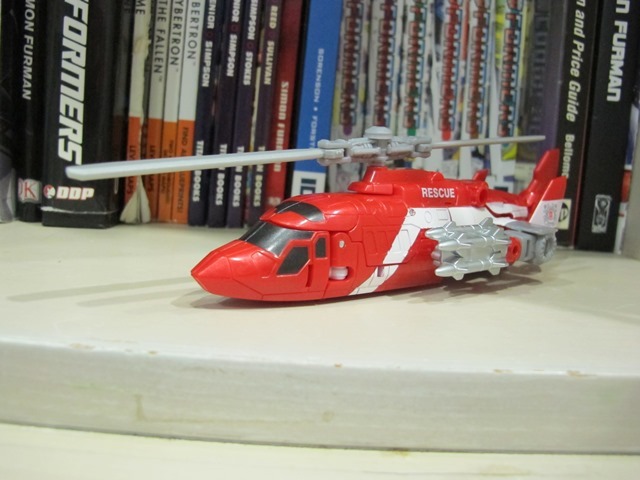 In the original toyline, Vortex was a military helicopter and Blades was a search and rescue helicopter, but with relatively limited resources and needing to put in so many other moulds, the two of them now share a mould. I did pick Blades up, though, because I needed a fourth limb to make a second gestalt, and I liked Blades the most as a character from the selection available. Other reviewers have talked about this mould�s strengths and weaknesses when it was released as Alpha Bravo and Vortex, so I�ll try not to retread the same ground. Blades transforms into what TFWiki tells me is a Aerospatiale Dauphin helicopter, which is an actual search-and-rescue helicopter. Looking it up in google, it�s similar enough in many aspects, and there are even some that have a red-and-white paint scheme like Blades does! That�s score one for the alternate mode, for sure. Blades is primarily red, with a white stripe running throughout his side, black paint for his windows, and tampographs showing rescue and a pretty nicely detailed decal on his tail-fins. His rotor blades are cast in gray plastic and spin relatively well. For being a rescue helicopter, though, Blades�s robot-mode arms are very distinctly slapped on the sides of the helicopter mode. The arms which have three gigantic silver missiles prominently displayed. It�s definitely in-character, though, because Blades? He�s blood-thirsty. So this bit actually fits him quite well. You can plug the robot-mode gun on the sides of the helicopter, and the Combiner weapon (which takes the shape of a huge rectangle with two gatling guns) on the bottom of the helicopter, but it looks awkward and breaks up the otherwise pretty nice-looking helicopter mode. Overall it�s not the best helicopter mode out there � despite the missiles hiding a lot of the lower arms, the shoulder balljoint is still very visible, and the rotor spins a bit too flimsily for my liking. It�s an okay alternate mode. I think I actually prefer Alpha Bravo�s more attractive paint scheme as far as rescue helicopters go, but Blades honestly isn�t bad. The mould�s robot mode was actually designed to emulate Blades more than it does Vortex � from the shape of the robot mode chest, to the positioning of the helicopter parts, it definitely looks more similar to G1 Blades� toy. The only real differences are the lack of landing gear kibble on his arms (though with the helicopter mode not having them at all, it�s a reasonable omission) and Generations Blades being a lot less blockier and slimmer. The missiles that wrap around his wrist is definitely not in the original toy, but I suspect Blades appreciates this result of mould-sharing a lot. Blades transforms pretty easily, similarly to most other Combiner Wars figures. The leg transformation in particular feels similar to a huge majority of the Combiner Wars toys like First Aid, Swindle and literally every Aerialbot. The resulting robot mode is, well, pretty compact, and Blades features a very accurate replication of his original toy�s deco, with more whites and grays breaking up the red. 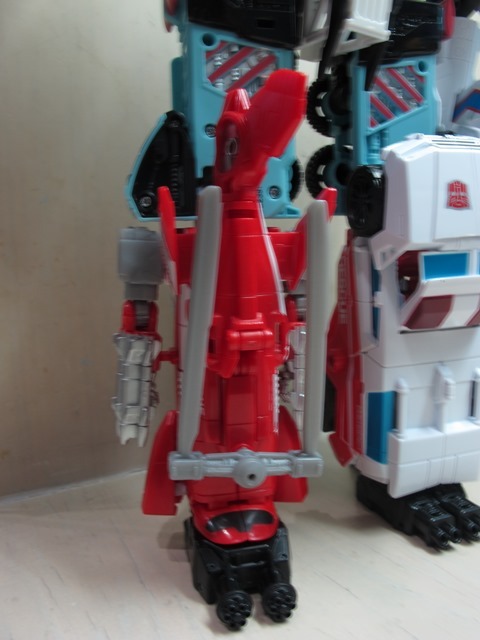 His face looks a bit silly with the baby blue relatively clashing with the red/white/gray thing he�s got going on, but it�s accurate to the original toy so I won�t begrudge them too much. I do find that Blades� proportion looks a bit weird, with his torso and abdomen being just one huge square and his hips being this very tiny little section. And the helicopter tail on his back jutting up and being very prominently displayed behind his head felt a bit odd. The helicopter blades don�t exactly fold up flush against his back super well either, pointing down from his back and just getting in the way of articulation. 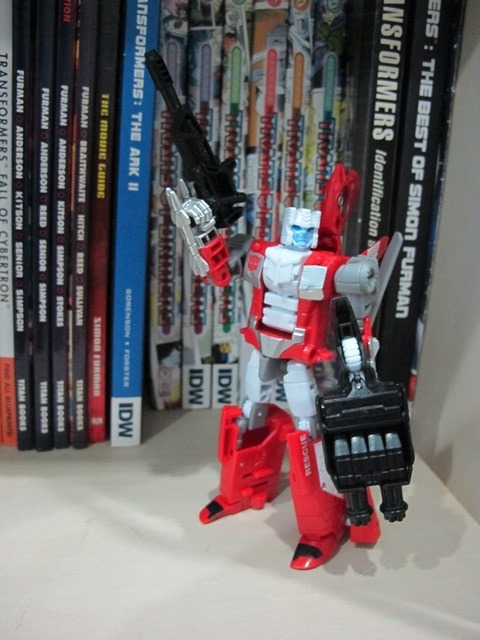 Blades does have one of my favourite moulded weapons in the Combiner Wars lineup, though, with his pistol being moulded with vivid bullets on his magazine. 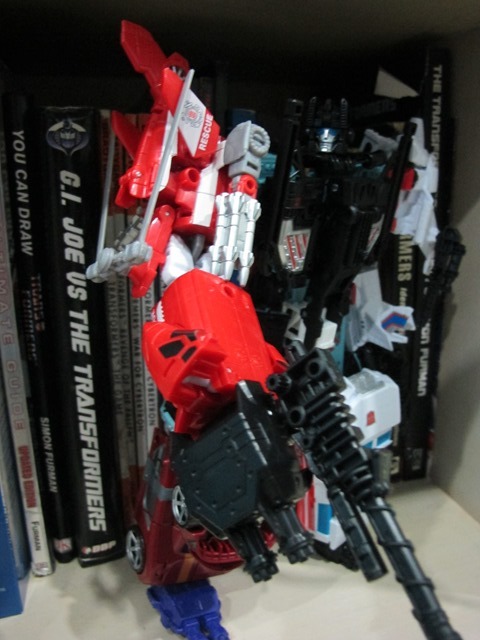 He can hold the Combiner weapon too, but it just looks dumb and impractical. Overall Blades just falls slightly short from being a perfect deluxe class robot, but considering that he�s not really meant to be a single package, it�s honestly understandable. Blades can form the arm or leg of Defensor, or any other combiner, though his �default� setup is as Defensor�s arm. I don�t really have much to say about this mode � it�s mostly similar to the other Combiner Wars deluxe toys. As a leg he�s basically just a solid block that can hold Defensor up sturdily, as an arm you semi-transform him to give him an elbow joint. Transformation Design: 4/10 It�s a very basic helicopter transformation, though I honestly think that they could�ve done something more with the placement of the arms. Not the missile-bound lower arms, which look cool, but the very obviously glaring shoulder joints in helicopter mode. Durability: 7/10 He�s made up of sturdy plastic, but the rotor blades really worry me. I�m not a barbarian and I don�t think I�ll break those rotor blades, but at the hands of a kid, considering how flimsy the rotor blades are, it�s not going to last long. Fun: 7/10 Eh, he�s a pretty average deluxe class robot. Honestly individually he�s a bit of a bore, but as part of a set he shines a bit more. Aesthetics: 7/10 They could�ve gone slightly different with the proportion of reds and whites � personally I�d actually prefer the alternate mode to not be as almost-entirely-red as it is, but it�s a decent-looking helicopter and robot nonetheless. Articulation: 6/10 The joints are there, but the hip joint is awkward. The legs are sturdy but not too poseable either. Value/Price: 5/10 Man, modern Deluxe class toys are expensive. I did get Blades as a discount, but considering how he�s normally priced, he does feel a bit expensive, and there really isn�t much going on for him if you�re not making a Defensor. He comes with a comic, but IDW hasn't really made any good tie-in comics for a long, long time. Overall: 6/10 Like the other Combiner Wars toys, Blades is� perfunctory, I guess. He's a great representation of the G1 character, he transforms well, he's got the joints. He just falls short of being a good gimmick-less deluxe class toy, but the thing is that he actually does have a gimmick � combining. Which requires you to buy four other toys. As part of a set, the fact that he combines offsets a lot of Blades� weaknesses. But as a standalone toy, he�s not bad but there is no situation in which I�ll really call this a great toy.